There aren’t many on my list of musts. But, this past weekend, Pappy’s Smokehouse in St. Louis earned a line on it. Gerard Craft, chef-owner of niche (and the attendant Taste and Brasserie), had commended Mike Emerson’s barbecue too many times to be ignored. So, to the smokehouse we went for lunch. Let me tell you about the baby back ribs here. They are delicious; glazed magazines of juicy pork so succulent that we shot off two slabs without trying, discharging the bones like cartridge shells, left and right. These stubby, taut packets of fatty meat are firmer and pinker than the meat on the beef ribs that I’m used to eating in Kansas City. Emerson rubs his ribs with spices and leaves you to sauce it yourself at table. He also sent out a sample of smoked meats: turkey, pulled pork and brisket. All of them were moist and tender, especially the brisket, which had a tighter grain than the brisket I’m used to having in Kansas City. Emerson’s brisket was rosy on the interior, almost like sliced steak. 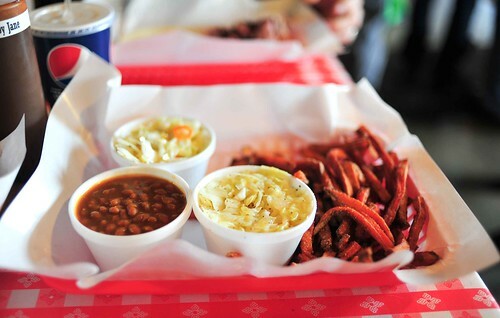 On the side, we had baked beans and slaw, which I particularly liked. Emerson’s cabbage is chipped (as opposed to shredded/sliced) and tossed in a vinegary sauce flecked with celery seed. I prefer this lighter type of coleslaw to the thicker, creamier type. And we had a stack of sweet potato fries, seasoned with salt and sugar, if I’m not mistaken. There were three sauces at the table. Pappy’s Original is thick, dark and tangy. Sweet Baby Jane is just as thick and dark, but sweeter. And there’s Holly’s Hot Sauce, which is thinner than the other two, high in vinegar with a mild heat; my favorite one. I barely looked at the menu, but I did notice there was chicken on it. I’ll have to return for it. And Frito pie too! After our lunch, Emerson took us back to his tiny kitchen, where he said his staff had smoked over a million pounds of meat last year to meet the demands of catering, take-out, and walk-in orders. Damn. The attention this places is getting is not undeserved. If you’re in St. Louis, you must to Pappy’s. * A special thanks to Mike Emerson, for your hospitality, and to Gerard Craft and Jeff Lehman, for introducing me to Pappy’s. ~ by ulterior epicure on January 24, 2012. Bonjwing, Thank you very much for your kind words. It was a pleasure having you in St.Louis, and I hope you will visit us again, soon. Please tell my friends at Oklahoma Joe’s hello. I look forward to my next visit to Kansas City. I’ve enjoyed their ribs at The Big Apple BBQ Block Party – tasty stuff indeed. I can only imagine how good it must be at the source! i enjoy a pappy’s rib as much as the next guy. that is, when I am home in st. louis, i’m a happy man when i pencil in a trip to pappy’s. i have to say though, the best bbq in st. louis is happening in backyards–in oil can smokers, etc. also, most st. louisans define bbq according to an irregular definition, that is, direct heat w/ bbq sauce. so st. louis style bbq, as it has come to be defined in its known community, is contrary to the dominant or accepted or canonical definitions of bbq. @Mike: Thank you for your hospitality. I will pass on your greetings to Jeff at Oklahoma Joe’s. @docsconz: You need to book a trip to the Midwest!! Pappy’s is always my first stop whenever I visit my brother in St. Louis. Those pork ribs haunt my dreams. BBQ chicken is also pretty darned tasty.